I wonder if French photographers are compelled to photograph anyone, whatever their age, carrying a baguette? Je me demande si les photographes français aiment aussi photographier n'importe qui ,quelque soit son âge, transportant une baguette de pain? But I would have taken this photo, too! Too cute! I never dare picturing people, but it would be a great idea to collect such pictures! Marie, non, il n'était pas seul mais avec son frere dans le village. Malyss, my favourite sort of photography is street photography. Don't know about the French ones, but it's always a temptation for photographers like this photo by Elliott Erwitt. i'm just sitting here smiling. Not sure about the French, but the rest of us who spend time in France and shoot pictures do, that's for sure. Great photo. Such a lovely composition Jilly...and who can avoid such scenes? Love it in B&W. Your photo makes me think of the Erwitt photo Bibi mentioned. 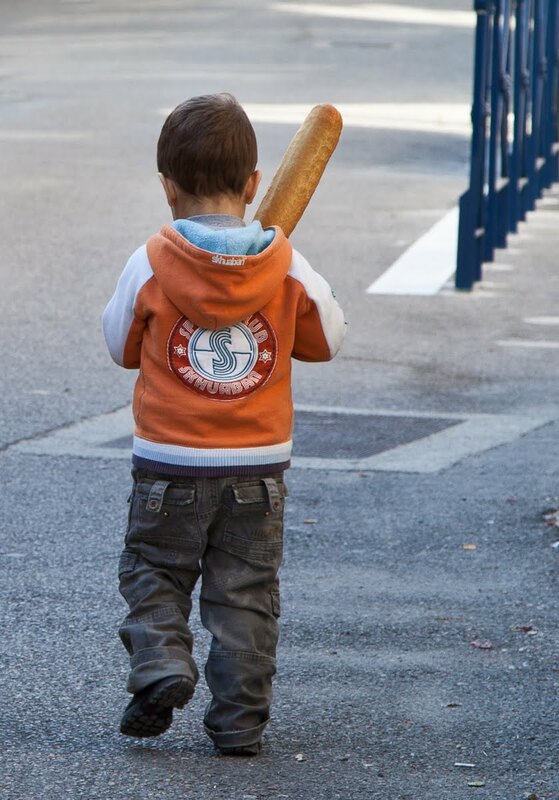 Baguettes and the French just go hand in hand. At least to those of us who are not French. Je préferè BW. Parfait !!!! Willy Ronis a photographié la fameuse baguette so French!